​The ​West Ham fan that invaded the pitch and planted the corner flag in the centre circle of the London Stadium claimed that he 'had to do something', as the London side fell to a third successive defeat on Saturday, in the 0-3 defeat against Burnley. 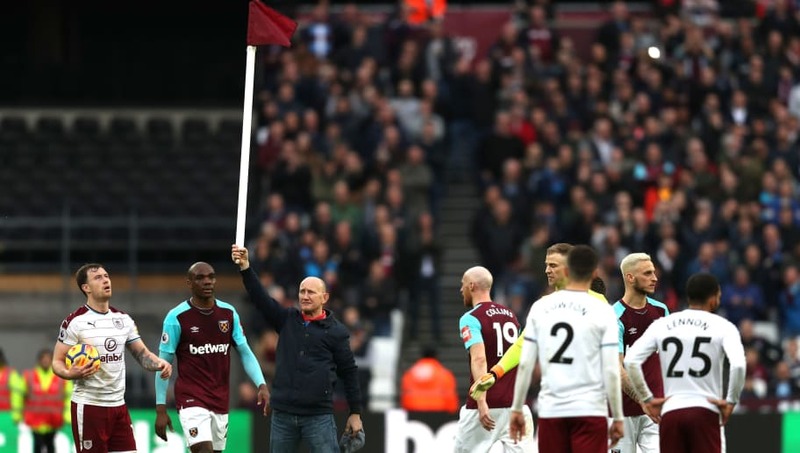 The protester, revealed as 61-year-old Paul Colborne, was among the protesters who caused the Premier League clash between the Hammers and Burnley to come to a standstill, as he ran on to the pitch at the London Stadium. The season ticket holder, who says he has been attending West Ham games for 49-years, handed himself into police following the incident. While fan fury boiled over at the weekend, ​with several fans invading the pitch and co-owner David Sullivan being struck by a coin, speaking to the MailOnline, Colborne claimed his behaviour was meant as a 'peaceful' protest against the way the club is being run. Colborne and his fellow fans' actions resulted in the game sinking into chaos as fans took to the pitch, while players ​attempted to defuse the situation. The 61-year-old admitted that he regrets his actions but said it was done on impulse as a result of his anger towards the club. Colborne told ​MailOnline: "I have been going to see West Ham home and away for 49 years and have seen more than 2,000 games. "I hadn’t planned anything, but I just felt I had to do something. You have to stand up for what you believe in." Colborne is among the Hammers fans disappointed by the move to the former Olympics Stadium from Upton Park in 2016 and revealed that he had been left angry by broken promises from the owners, as West Ham battle to remain in the ​Premier League. "I had to do something. I wasn’t being violent, but I couldn’t take it anymore when Burnley went 2-0 up," said Colborne. "They have lied. I hate the stadium but the carrot from them was that we would have a half-decent team. Instead we have got a horrible stadium and a team that hasn’t delivered anything." West Ham could be punished heavily following the ugly scenes on Saturday and could find themselves charged with a sizeable fine and even ordered to play the remainder of their home games this season behind closed doors, without supporters. Colborne insisted that his protest was meant as a 'symbolic gesture' and there was never any violent intent, although he conceded that he has to face the consequences of his actions. "Encroaching on the field of play is a criminal offence, but I am worried that they were going to link it all with those people who were semi-violent. I want to be dealt with as a separate entity which I believe it is," he added. "Mine was supposed to be a peaceful symbolic protest or gesture that we fans can’t take this anymore."